"My family's world has been shaken by the loss of a husband, a father, an uncle, a brother, a nephew, son and dear friend," Sgt. Helus' widow said. 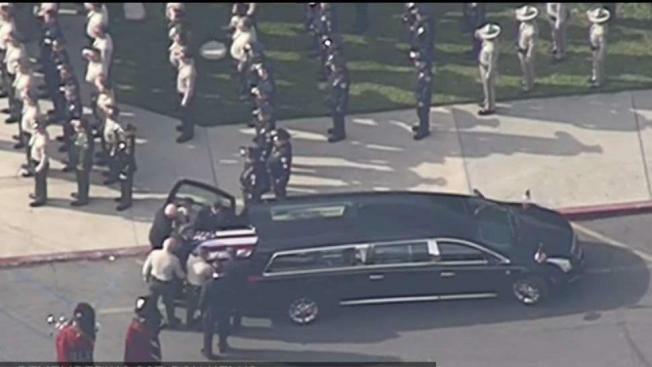 Scores of law enforcement officers, deputies, relatives and friends packed a Westlake Village church Thursday to bid farewell to Ventura County Sheriff's Department Sgt. Ron Helus, who was killed during the mass shooting at the Borderline nightclub in Thousand Oaks. Helus -- the first law enforcement officer to burst into the Borderline club late the night of Nov. 7 amid reports of a shooting inside the building -- was hailed as a hero for confronting a gunman and likely buying time for hundreds of people inside to escape. 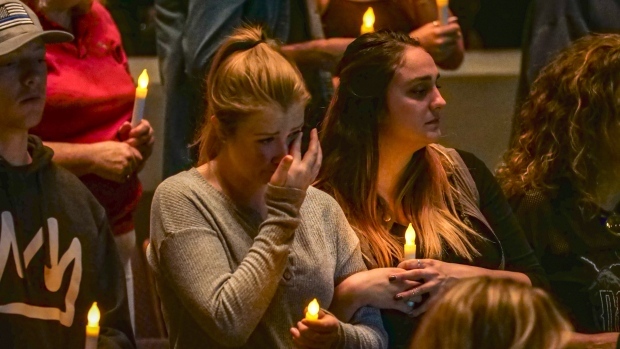 "In the last few days, our family has experienced an outpouring of love that is nothing short of inspiring," Helus' niece, Lauren Smith, said during the service at Calvary Community Church. "We are overwhelmed by the level of care and sympathy that this community -- our community -- has shown us." "My family's world has been shaken by the loss of a husband, a father, an uncle, a brother, a nephew, son and dear friend," she said. "We mourn with all the others who lost their loved ones. There are many more nights of pain and processing to come; and in those times, we may feel lost, alone, and as though the world is full of darkness. But ... we may find comfort in knowing, as Ron did, that this world is only temporary, and that we are not alone." Sheriff's officials say Helus, 54, and a California Highway Patrol officer with him exchanged gunfire with the Borderline shooter. Helus was shot, and the CHP officer managed to pull him from the building. He died at a hospital. The gunman, 28-year-old Ian David Long, a former Marine and Cal State Northridge student, was later found dead inside the building from an apparently self-inflicted gunshot wound. Eleven other people were fatally shot by Long inside the club, which was crowded with mostly students during a country-music-themed college night. Helus, a 29-year-veteran of the department, was a married father of a grown son. He had just called his wife and told her he loved her before he responded to the Borderline bar, sheriff's officials said. Calvary Community Church Pastor Steve Day began the funeral service by inviting those in the crowd to stand and give Helus a standing ovation. The crowd responded in thunderous fashion. Country singer Billy Ray Cyrus performed with a choir in tribute to the fallen lawman. Gov. Jerry Brown was among the dignitaries in the crowd. Asked prior to the service about the confluence of the shooting and the devastating wildfires that erupted just hours later in Ventura County, Brown called it a "double tragedy." "It leaves a scar that is not easily healed, but in time it will," he said. "At this point, it's so very important that we pull together as a local community and the state of California. Things happen. Tragedies occur. That's part of what being human is. But it's also being human to bind up our wounds and to do everything we can in solidarity." During the service, Pastor Charley Maloney of the Camarillo Christian Church read a letter that Helus' wife, Karen, wrote to her late husband. "Ron: Thank you for sharing the last 31 years with me," she wrote in the letter. "You were my husband and best friend. You were always the one who made me laugh, and protected me from all that tried to harm me. Thank you for being you; my hero, my love, and my life. I will always love you and hold a special place in my heart that is only for you. I know that when God saw you enter heaven, He said, `Well done, good and faithful servant." "I'm so proud of you, and the kind of person you were. I will miss you and your hugs and our life together. Rest now, sweetie. Save a place up there for me, and I will see you again. Love you forever, Karen." A graveside service followed the funeral at the nearby Pierce Brothers Valley Mortuary and Cemetery in Westlake Village.